Types of Continuous Probability Distribution? How to make ARIMA models in time series using R? How to do factor analysis using R? Who are Data Scientists and what they do? Statistical cluster analysis is a Exploratory Data Analysis Technique which groups heterogeneous objects (M.D.) into homogeneous groups. We will learn the basics of cluster analysis with mathematical way. In HCA, the observation vector(cases) are groups together on the basis of their mutual distance. A HCA is usually visualised through a hierarchical tree called dendrogram tree. This hierarchical tree is a nested set of partitions represented by a tree diagram. Sectioning a tree at a particular level produces a partition into ‘g’ disjoint groups. If 2 groups are chsen from different partitions then either the groups are disjoint or 1 group is totally contained within the other. A numerical value is associated with each partition up the tree where branches join together. This value is a measure of distance or dissimilarity between two merged clusters. Different distance measures give rise to different hierarchical clusters structure. Operates by successive merges of cases. Begin with a clusters, each containing single cases. At each stage merge the 2 most similar group to form a new cluster, this reducing the number of cluster by n.
Continue till(eventually as similarity decreases) all subgroups are fused to form one single cluster. Divisive method operates by successive splitting of groups. Initially starts with a single group(i.e. one single cluster). Group is divided into 2 types: 1) The objects in one subgroup are as far as possible from the objects in the other group. 2) Continue till there are ‘n’ groups, each with a single cluster. 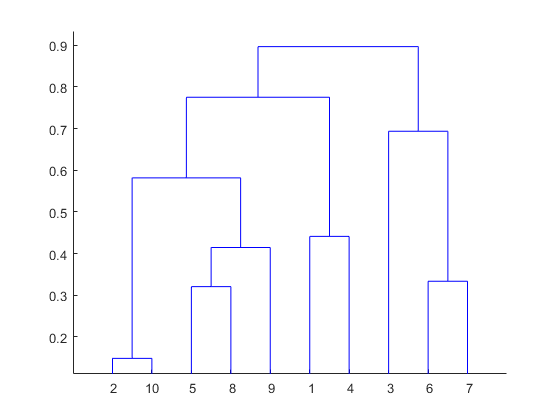 Note: Result of both the approaches are displayed through the dendrogram tree. Search the distance matrix (D) for nearest (most similar) pair of objects. Let the distance between the most similar cluster say (U&V) be denoted by d[u×v] . Deleting the rows & columns corresponding to the clusters U & V.
Adding a row & a column giving the distances between the newly formed cluster (U,V) and the remaining cluster. Repeat points second & third a total (n-1) times. Record the identity of clusters that are merged and the level(distance or dissimilarity) at which they are merged. Structire the dendrogram tree fromthe information on mergers and merger levels. Distance between cluster 1 &2 ? Centroid Linkage: Distance between centroids of two clusters. Median linkage: Distance between median of two clusters. Hierarchical cluster analysis ends here, in the next tutorial article I will explain Non-Hierarchical cluster analysis. Till then stay tuned and keep visiting for learning tutorials which you won’t get anywhere. If you have any doubts please mention in comments or shoot me an email @ irrfankhann29@gmail.com.